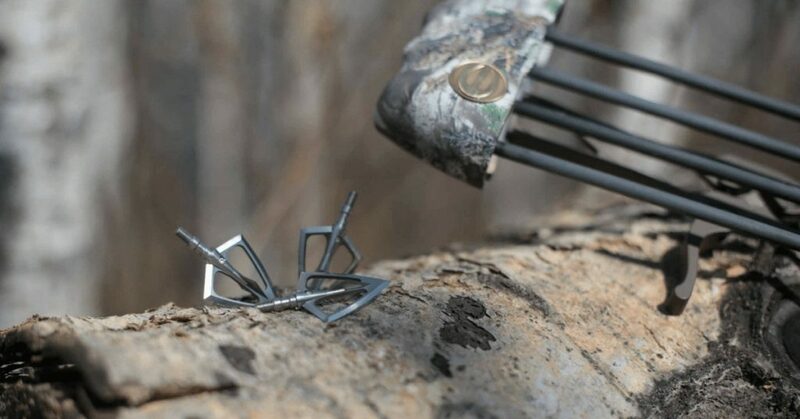 10 Best Broadheads 2019 - Mechanical or Fixed Blade for Crossbow? When you want to hunt with your bow and arrow, you might find that you need some extras to really get the most out of your experience. One of the most important parts of your setup will wind up being your arrowheads. There are different variations of arrowheads that you can get. For hunting game, you will want a broadhead. And in order to get the most out of your broadhead, we’re going to guide you on your way to finding the best broadheads for your situation. Broadheads come in many different shapes and sizes. There are mechanical heads, fixed blades, and even replaceable blades. What you need will really depend on the situation. Luckily, we’re going to be going over what you should keep an eye out for. We’ll also be providing you with our favorites for various kinds of game. Choosing your broadhead will depend on a couple of different of things that you want. 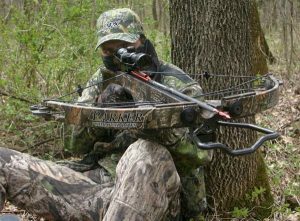 In fact, this process of picking a broadhead will really depend on what you want out of your bow. 1. 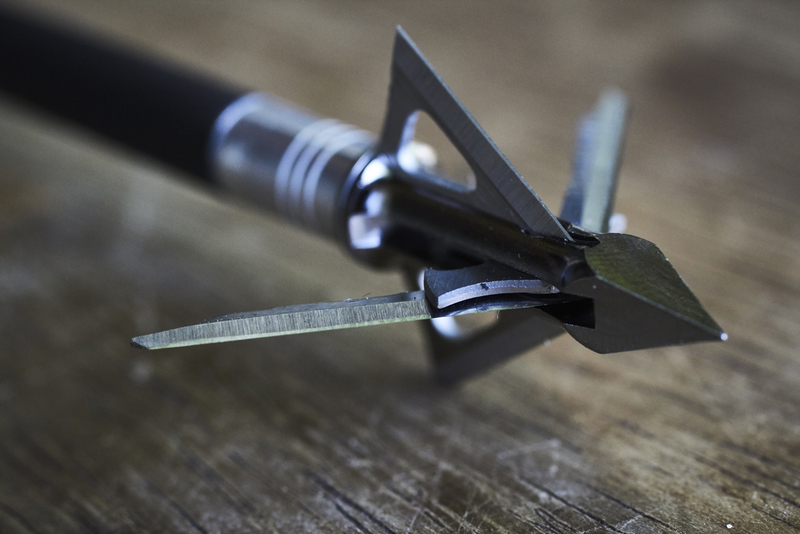 Price – This may be the first thing that you consider about a broadhead. They can be a little bit expensive because they are well-engineered pieces of metal. There are good cheap broadheads out there, but they might not be as nice or well made as some of the more expensive counterparts. So you might have to balance out how much you are willing to pay with the kind of quality that you want from your broadhead. 2. Number of Blades – Now, the number of blades will largely depend on the kind of broadhead that you decide to go with. If you want a mechanical broadhead, then you’re going to find that they have fewer blades overall than a fixed broadhead. So if you want something with more blades, then you might have to move away from a mechanical blade. The number of blades can change the kind of wound that you are inflicting. Whether or not you want more blades will depend on your game. 3. Kind of Game – This is probably the most important factor that comes into play when you’re trying to pick out a broadhead. Regardless of how much you want to pay, there are going to be broadheads that work best for elk, but they won’t work as well for hogs or deer. So if you’re not sure about what you need to be focus on for hunting, you’ll want to research that so you are aware of what you think you need. We’ll be covering the best broadhead for elk, deer, and hogs. But there are many more things that you can hunt with a bow. If you’re looking for a broadhead that will outperform anything else that you have, then I would highly suggest this Exodus. While it doesn’t look that cool or fancy, the broadhead is made to do its job well. There are many different kinds of hunters out there, but I’m sure that most of them would agree that the Exodus is incredibly well made. The broadhead will last for a long time (perhaps longer than the arrow it was attached to) and it excels at downing deer. These are made to be sharp as soon as you get them, so they’ll be ready for whatever hunting you have planned right away. These broadheads are just slightly more expensive than others out there, but the price if well worth it. 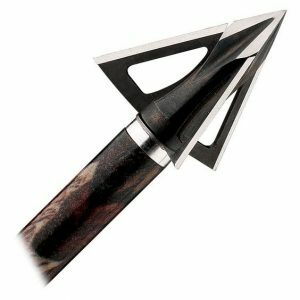 If you want to hunt deer, then you’ll be able to drop as many as you hit with this broadhead leading the way. When you are looking for a broadhead, finding one that is cheaper can be particularly important. This is because your pockets aren’t endless and you could end up losing a broadhead or two when you start taking them out for hunting. Hopefully, you aren’t losing your broadheads, but it can happen. 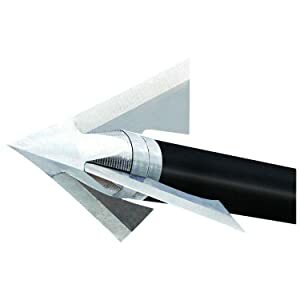 Getting a cheaper one like this fixed-blade broadhead can be a great way to get started. If you lose one of these, then it’s a little less of a struggle. However, don’t let the lower price of this broadhead fool you. This broadhead is made for your fastest bows. You’ll be able to shoot quickly and accurately with this one. The biggest concern for this particular broadhead is that it isn’t as sharp as other broadheads. It also doesn’t have the same cutting area as others. However, the smaller size and less sharp blades are part of buying a slightly cheaper broadhead. Having more blades can really affect how deep your arrow goes or how much bleeding your target will do. If you’re looking for more blades, then you’ll want to look at this Carbon Express broadhead. Fixed-blade and replaceable broadheads are going to have four blades typically. This is already more than most mechanical broadheads. However, this broadhead has a slightly different configuration. While the base blade has only two cutting edges, there are bleeder blades that you can add onto the broadhead. With those attached, you will have six cutting edges. This kind of blade is best when you need your arrow to penetrate deeply or you need a wound that will bleed a lot more. Some people don’t find that this works with their game, so you’ll want to make sure that a deep wound is what you need for your hunting. 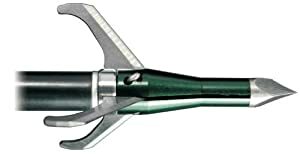 Fixed blade broadheads are one of the main options for hunters. A lot of these have a cut on contact tip. This means that your blade is going to sink easily into the game that you’re hunting. This particular fixed blade has four blades with two main ones and two bleeders. This means that if you don’t down your game on the first hit, you’ll at least be able to follow the blood trail left by the wound. The downside to this particular fixed blade is how expensive a pack of three of these really are. This can make some people not want them. However, these broadheads are going to fly straight and leave deep wounds. They’re also made out of extremely sturdy materials, so they’re going to last longer than other fixed blade broadheads that are available out there. The benefit of a replaceable blade is the fact that you don’t have to buy the entire broadhead every time you need to get a new one. These broadheads are designed so that you just have to replace the blade part of the system when you need to update it. This means that overall, you will spend less money on all of the parts and instead only spend money on the parts that you are consistently using. This also means that you will be able to get in and fine tune the parts that you are using. There are only three blades on this particular broadhead, but since you’ll be able to adjust it for what you need, this shouldn’t be too dig of a downside. They are also a little bit more expensive than other broadheads out there, but since you’ll be able to adjust and replace parts when you want, the price is just a small part of how you should think about this particular broadhead. Mechanical broadheads aren’t always thought of as a good part of your arsenal. When they first started, the broadheads weren’t always something that people could use. The broadheads were difficult and finicky and the designs didn’t always work. Cabela’s broadhead is thus a beautiful thing. This mechanical broadhead is incredibly simple, which means that it works well. Instead of the convoluted systems that other companies use for the mechanical broadheads, Cabela’s went with something to simple to ensure that it will work every time you use it. The broadhead is quite sturdy and will be able to handle anything you shoot it at. This broadhead won’t fall apart when it hits your target. When you look for broadheads, you will find that they are categorized into different weight categories. However, these overarching categories of 100 grain and 125 grain do not often show how much these different broadheads weight. The Innerloc EXP is a 100-grain broadhead that is truly 100 grain. It is as close as possible to the appropriate weight. But that’s not the only thing about this broadhead that you will like. This mechanical broadhead might feel a little difficult to open when you’re using your hands, but this is a great thing. It means that your broadhead won’t prematurely deploy. Test it out the next time you go hunting. You’ll like the way that these broadheads behave out there when you’re actually hunting. The difficulty with the blades might be annoying when you’re trying to work on them, but it will make your overall hunting process go a lot smoother in the long run. They aren’t that expensive for a 3 pack as well. There are many different designs of blade styles when it comes to broadheads, but the style of the tip of the broadhead is also something that can change. 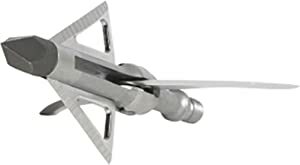 A cut-on-contact broadhead has a sharp point that is the beginning of the blades. 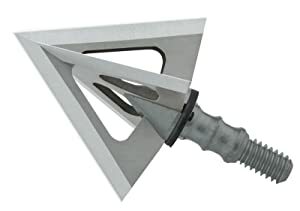 This kind of broadhead can be great for getting that deep hit to your target if that’s what you need to down it. This reasonably priced fixed blade is great for all types of hunters. There are four cutting edges on this that are well designed and very sharp. Although you might think that this broadhead is a little bit small, you will be happy to know that the smaller size is to help ensure that you are able to hit your target. 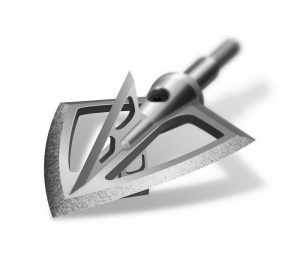 This broadhead won’t off balance your arrow or throw its trajectory off. In fact, it will probably help your arrow fly as straight as it possibly can. The main downside to this fixed blade is that it isn’t as sturdy as some others. Unfortunately, you will find that once the blades have broken, the entire broadhead is useless. That may make some people want to avoid this kind of broadhead. These broadheads are on the cheaper side, but that doesn’t mean that they can be helpful. You will want to look for a chisel tip when you are looking to get game that has a tough hide. While a cut-on-contact may go deep into some game, it may be ineffective with game that has a thick hide. The chisel will break through that hide and then the blades will be able to make a nice wound in your game. You will take down your game more easily when you have this one on your side. This broadhead is cheaper, which means that you can be less concerned when you manage to lose one, but it also means that it will be slightly less durable than other broadheads out there. If you want a broadhead that will keep going until you eventually lose it, then this won’t be the one that you want. This broadhead is great for beginners or those that don’t want to spend a ton of money on a broadhead. This one will be able to take down lots of different types of game as well. There are many hunters out there that want a great broadhead that they can keep forever. This will reduce costs over the long term. It also means that you’ll be able to get used to the particular difficulties and tricks that come with a specific type of broadhead. 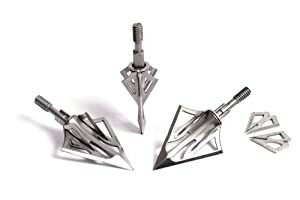 The Grave Digger broadheads are a combination of fixed blade and mechanical broadhead. Combining these two really allows you to get the most out of your broadhead. With a chisel tip, you will be able to get through the hide of any game with ease. However, it’s really the combination that makes this a winning broadhead for most people. There is a worry that your mechanical broadhead will expand early or that it might get stuck. That isn’t the biggest concern with this broadhead. 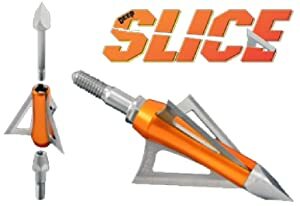 You will find that this broadhead takes the best of both worlds to try and make sure that your arrow does the most amount of damage. If the mechanical side doesn’t deploy correctly, then you will have the fixed blades to make up for it. Even if it doesn’t down the deer, you will still have a wound that is bleeding that will hopefully let you track the deer and make another shot. However, this broadhead does extremely well. It’s fairly priced as well, which makes this a solution for many different hunters that need a broadhead that will do a lot. Because the broadhead is also very durable, you will not struggle to keep using it over and over and over. While there are broadheads that are marketed as much better for your crossbow, you will really just need to do some extra testing to see if the broadhead will actually work on your crossbow. There are a few broadheads that tend to work better with crossbows. The ones we have chosen are specifically more fixed broadheads. They tend to do a lot better when going from different kinds of bows. But like we said, you should do some testing of your own to make sure that your bow can handle them. We’ve already written about how great the Exodus is when it comes to downing game. However, it works really well when you’re hunting deer. The shape and design of the broadhead will allow you to get right into the vital organs. Even if the deer don’t drop as soon as you hit them, then you’re not going to have to go far to find them. If you don’t want the Exodus, then look for broadheads that will cut cleanly through your deer. You don’t have to worry about particularly thick hide or bones in the way of the vitals when it comes to deer. If you can get something that will go cleanly through the deer’s organs, then you’re onto the right kind of broadhead. You already know that the Carbon Express has more blades on it than many others on this list. This arrow will be able to leave deeper and bloodier wounds. This will make tracking a hit but not downed elk a lot easier. You don’t want something that won’t stick in far enough, which is why this broadhead may just be the best solution. If you decided that you didn’t particularly want the Carbon Express broadhead, then let me give you more general tips on what to look for and avoid for hunting elk. Elk is harder to take down than deer, so you will need something just a little bit stronger than what you would use with deer. I would strongly recommend staying away from mechanical broadheads when you’re hunting elk. While mechanical broadheads are getting better and better, they often don’t puncture as deep as fixed or replaceable blade broadheads. You will need a broadhead that can get in deep. You might also want to look into broadheads that are slightly heavier such as 125 grain. Hunting hogs, wild boar, and other pigs is a much different game than hunting deer or elk. 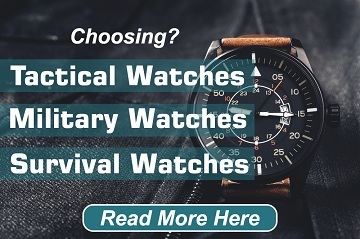 You will need something that can penetrate deeply through the hog’s hide and still hit the vital organs. Our Muzzy is a great option for that. However, if you’re looking for another broadhead, then I would suggest looking for fixed blades. They tend to be sturdier and better able to get deeper into the hog. But it isn’t just the broadhead that you should be looking at when you’re hunting hog. Your broadhead should be on the heaviest arrows that you have. This will ensure that your arrow will go through the game that you’re hunting. 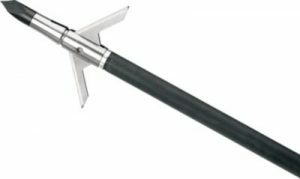 While the broadhead we have suggested is a four blade, you may want to consider a two blade for hog hunting. Two blades will allow the arrow to pass through a little easier. Four blades will create a bigger wound which will allow for easier tracking if you don’t manage to take down your hog on the first shot. When it comes to hunting, there is so much to consider. Everything you buy can affect how you perform when you’re out there in the wild. All of the options on this list are great, but I would have to say that I like the Qad Exodus the most. It seems to do everything I want and would be a good match against the kind of game that I would want to hunt. But everyone is different. Hopefully, our list gives you an idea of what you need to be doing and what you should be looking for. Take time to research and ask questions about the kind of game that you’re hunting. While getting a deeper hit is always better, there might be more that you need to consider about your game. Whatever you hunt, an excellent broadhead will give you an advantage. You folks farmiliar with the THORN mechanical broadheads?? i shot the G5 2 blade and they really do the job.